One of the biggest entertainment agencies from South Korea, SM Entertainment, has opened a representative office in Indonesia. As reported by Kompas.com, SM Entertainment Indonesia has opened a branch on the fifth floor of the fX Sudirman shopping center in Central Jakarta. The office features a pink and white color scheme that decorates its minimalist-yet-Instagrammable interiors. On display in the main area are photos, albums, posters and merchandise of artists who are signed with SM Entertainment, among them Super Junior, EXO, Red Velvet, Girls Generation, SHINee, f (x), NCT and TVXQ. They are arranged together neatly, but are not allowed to be touched. Rooms labelled "Audition Booth" and "AR Photobooth" are open to the public, while other areas are closed off for internal use only. With the branch being a functioning office, it is open from Monday to Friday from 10 a.m. to 7 p.m.
A staff member named Rubina Winnie said the office opened on Feb. 4 without a formal ceremony, clarifying that it is not an SM store. "This office is a representative in Indonesia. So if there are companies or TV stations that want to use our stars, they work together here. So we prepare it," Rubina said, as quoted by Kompas.com. Rubina said the office currently employs 10 people and is led by SM chief executive Han Kyung-jin from the headquarters in South Korea. Regarding the collection of merchandise, posters, photographs and so on, Rubina said the items currently featured are there only temporarily, explaining that they are from Han's private collection. "The merchandise and other things are still on their way from Korea. The current ones are from the CEO's personal collection. The ones coming from Korea would be for display here," she said. In explaining the two featured rooms open to the public, Rubina said the Audition Booth is to be a karaoke room where auditions would be conducted by SM Entertainment as needed. "We have not yet operated it. So if there is a global audition, or there is an event, they would audition at that place and it can be sent [to the head office] if there is potential," she said. The AR Photobooth, she added, is a green-screen room where visitors can take pictures with artists from SM Entertainment. 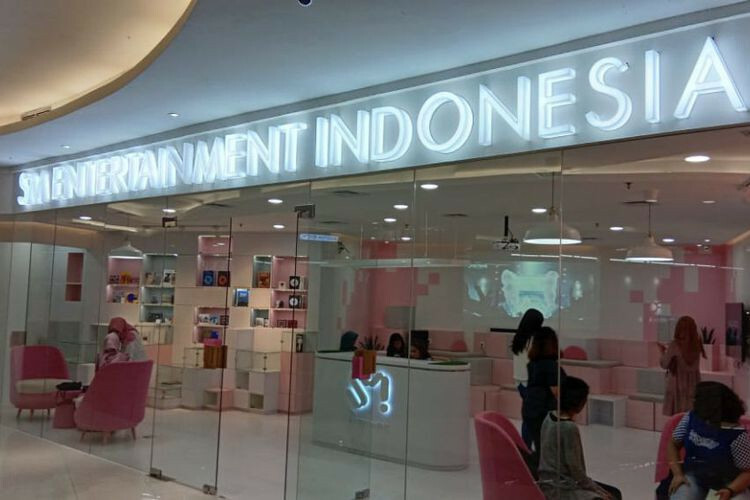 A visitor, Angel, 26, said she had become curious after information circulated about the opening of the SM Entertainment representative office in Indonesia. "I wondered what they had in the office. Is it like the one in South Korea that has a showcase, auditorium and store? It turns out that this is just the office," she said. As a fan of K-pop music, Angel said she was happy about the opening of a representative office in Indonesia. The design of the office, she added, follows the nuances of its headquarters in South Korea.